After all the rituals that wedding calls for, the honeymoon is the golden time when you get to live the romance. It's a time whrer you get to know your partner closely and begin a happy journey ahead. So, there should be no way you compromise with your honeymoon destination. You need the nature's beauty, the romantic spots, the luxury of villas and hotels and a lot of new places to explore, which is why many people love to honeymoon in Bali is all about that. You get the splendid beauty of the crystal clear waters and the shimmering white sands, the luxury of the villas and beach resorts to pamper your love, the hidden places to explore and rice terraces to stroll, the culture to indulge in and beautiful sunsets to marvel at. Nusa Dua Beach is the hub of adventure sports in Bali. If you and your partner are looking forward to trying some new and unique adventure sports then this is the place to pick for your honeymoon in Bali. You can enjoy underwater and as well as water sports at Nusa Dua. Some of the most sought-after adventure activities are the banana boat ride, jet ski, flyboarding and for the underwater experience, you can go for scuba diving, sea walking, cave diving and snorkelling. Suggested places: Potato Head Beach Club, Mirror Bali Lounge, Ku Te Da, OPIVM Nightclub, Paddy's Pub, Motel Mexicola. Seminyak is basically the cosmopolitan side of Bali. This is where you'd find the most opulent beach resorts overlooking the azure Indian Ocean. Seminyak is the hub of best nightclubs, bars and cafes in the whole of Bali. Then there are lively beach shacks lined across the shoreline and the beaches which are home to the bizarre beach parties, as well as cosy times for you and your partner to relax and get comfortbale in during our honeymoon in Bali. If you are night owls, the nightlife of Seminyak is the pulse of Bali and you need to be there to know what's the hype about. It wouldn't be wrong to call Ubud the heart and soul to Bali. Ubud is known for its splendid beauty of the rice terrace gardens, especially the Tegalalang Rice Fields that are also the part of UNESCO World Heritage Sites. The plush rice fields are spread all around are perfect for a lovely stroll or to enjoy a bike ride with your partner during your honeymoon in Bali. Rice fields also take you through the dense vegetation of the island, the small hamlets and their lifestyle and the culture of the local Balinese people. You can witness how these rice fields run so many families in Ubud and are the soul of the local people here. If you believe that the 90s was the most romantic era of our times then there is a way you can live it again. Gili islands is a group of three small islets Gili Trawangan, Gili Meno and Gili Air, each one of them extremely beautiful and tranquil in their very own way. It can be reached by a boat ride from Bali. The island is a beautiful mix of vintage and modern lifestyle. The most distinctive feature of the island is that you won't find any means of transport here apart from a horse carriage which is called Cidomo. This will surely give you the old vibes. You can also rent a bicycle to explore the never seen before places of the island with your partner. Apart from this, you would get a chance to go for scuba diving, attend the beach parties, stay in the most lavish accommodations and enjoy the romantic dates. Gili Island is the ultimate destination for a honeymoon in Bali, perfect for those who are looking for a serene experience. Home to a number of volcanoes and hills, you would find ample hiking options in Bali. But there is one trek that beats them all. Located at an elevation of 1,717 mts, Mount Batur is the most popular trek in Bali. Known for its surreal sunrise landscapes, you and your partner will definitely not regret making this trek on your honeymoon in Bali. The best time to go for this trek is if you leave early in the morning and reach on top just in time to view the sunrise. If you go with your guide or travel group, they would take you on time to make sure you are the witness to this magnificent beauty. Other temples that are worth a visit in Bali are Tanah Lot, seaside temple known for its sunset sceneries and Uluwatu Temple, again a seaside temple located on a cliff. Head to Sanur beach to board your luxury catamaran to Lembongan Island, a must-viti during your honeymoon in Bali. Nusa Lembongan Island is the quieter side of Bali where you can enjoy a luxurious cruise while you spot the marine life and vibrant coral reefs. It has a collection of pristine beaches, a number of water sports and the beach clubs that are way too good. It is also home to the highest peak in Bali called Mount Agung and you can enjoy a trek to view some gorgeous island vistas. Stay here overnight for the best experience. While you are here you can also visit Nusa Penida which has some beautiful shoreline spots, beaches and cliffs where you can get tons of pictures for your Instagram feed. With all the activities that Bali offers to its tourists, you will fall short of time but you would get bored with trying different experiences. Here are basic things to do that are must while honeymooning in Bali. It's just lovely to watch the most friendly animals diving in the sea, and is sure to set the mood for you and your partner while honeymooning in Bali. Head to Lovina beach in the morning to watch the dolphins hopping up and down in the sea. The experience is made better as you visit the beach early in the morning to marvel at the beautiful sunrise. After you spot the dolphins, you can enjoy the breakfast at a beach resort in Lovina Beach. When we talk about experiences in Bali, it is sure that they ought to be unique and unbelievable. Head to Bali Swing which is located in Ubud for an unreal experience. The swing is located at the end of the cliff at the height of 78 m with the backdrop of the rice terraces, palm trees and the ever-flowing streams. You are attached to the safety harness before you enjoy this ride which will give you butterflies in the stomach. It's just not the swing, the place is adorned with installations such as bird's nest, helicopter, tree houses, and the cliff at the end of the world which makes this whole package worth spending your money for. You can also stay in the tree house located around the swing. Bali is known for being home to the world's most expensive coffee. And you'd be surprised to know how it's produced. Kopi Luwak, the famous coffee in Bali, is made from the faeces of the Asian Palm Civet who is first made to eat the coffee beans and the final product is extracted when the civet excretes. It may not sound very pleasing to you, but doesn't it excites you why this coffee is the most expensive in the world and why coffee lovers go crazy for it? If you or your partner are a coffee person, you would surely like to have a taste of something different during your honeymoon in Bali. There is no shortfall of the adventure sports in Bali, and if you are an adventure-loving couple, look no further than Bali while planning your honeymoon. You can enjoy both water sports on the sea and you can go ahead underwater to explore the abundant marine life. Head to Nusa Dua for adventure sports like Jet Ski, Banana boat ride, parasailing, flying fish, flyboarding, motor boat ride and much more. If you enjoy the underwater life- then head to Nusa Lembongan island where you can come close to the coral reefs and the number of underwater species. You can go for scuba diving and snorkelling. But if you are looking for a unique experience, sea walking is a must try. Bali is also known for its cave diving, if you are a good swimmer don't miss out on this thrilling adventure sport. Read more about Scuba Diving in Bali. Seminyak is the most famous shopping spot for the tourists in Bali. From high-end boutiques to big lavish malls there is everything you wish for in luxury. On the other hand, if you want some flea shopping experience, Seminyak won't disappoint you either as it is lined up with the local markets selling local Balinese handicrafts, souvenirs, clothes and other things. Bali is very famous for its silver jewellery and you can head to Celuk village which has some mind-blowing jewellery pieces. Bali's culture is its pride. They celebrate it and preserve it with the utmost respect and love. If you and your spouse are fond of getting insights into the Balinese culture, there is so much to see around during your honeymoon in Bali. You can book your show for the cultural dance shows of Bali and you won't regret it for a minute. Watch the beautiful Bali dancers dressed in their traditional attire and jewellery. You can watch Barong, the dance to pay tribute to the kings and Kecak, which is a dance form inspired by the Ramayana mythology. Bali is known all around the world for its spa sessions and home remedy techniques and there has to be a reason behind it. There are different types of spas that will surely calm your nerves and rejuvenate your mind and your partner's mind. As they are located amidst the epitome of nature's beauty the experience gets better with the surroundings, sure to give you guys the perfect romantic vibe for your honeymoon in Bali. Why is Bali a Good Honeymoon Destination? 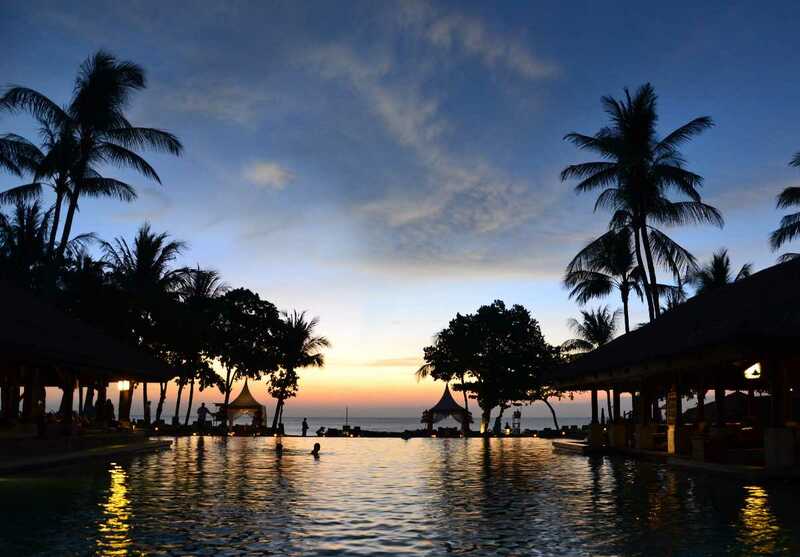 Located on the shores of the Indian Ocean, Bali has best of what you can expect of the beaches. The white sand beaches lined across the shoreline of the infinite sea is an undefined beauty. There are all sorts of beaches on the island, promising to keep you and your spouse entertained and captivated throughout your honeymoon in Bali. The one with the beach shacks, the one with the beach party, the serene one with amazing views, the unexplored one, the hippie beach, the one where you can enjoy a romantic date and the one where you can head out for the adventure sports. With such an exquisite variety of beaches, you can't go wrong on your honeymoon. Kuta beach: The beach is famous among the surfers and is known for its nightlife. Seminyak beach: The beach is known for its cosmopolitan culture, a hub of beach clubs and nightlife. Nusa Dua beach: The beach is known for its variety of adventure and water sports. You don't want to be held back from spending when you are on your honeymoon and you don't need to when you are honrymooning in Bali. The currency in Bali is very cheap and when I say very cheap, it means 1 INR is approximately 200 IDR. Everything in Bali comes at a price that won't burn your pockets even if you go for the most luxurious experiences. Bali, being an island in itself is an undefined beauty. And, if that beauty is added by another set of islands around, then your honeymoon experience just can't get any better. One of the most famous islands which are popular for the romantic vacations is Gili Island, frequented by many newly weds as their destination of choice for honeymooning in Bali. The old vibes of this island and the unexplored places will leave you speechless. Nusa Lembongan and Nusa Penida are two other islands that are just a short boat ride away and are known for their splendid beauty and water sports. If you are looking for an offbeat experience and there is no better choice than Lombok island where you can head out for hikes and visit waterfalls. And if you want to see something unbelievable, then how about a pink beach which is located on the Komodo island? Once you and your spouse set out to explore these islands, you would have a hard time coming back. The beautiful experience of sailing on a luxurious catamaran or a cruise is something that you and your partner can't afford to miss on your honeymoon in Bali. Known for its luxurious cruises with experiences like live Cabaret, jazz nights, candle night dinner and much more, you and your partner will not regret choosing Bali as your honeymoon destination. You must also check out some amazing boat parties while you're here. Jiggy's boat party is amongst the craziest parties happening around Bali that takes you around Lombok and Gili islands on a boat full of party lovers from around the world. Your experience of honeymooning in Bali would be incomplete if you were to miss out on some of the more exotic and lucxurious experience of this island in Indonesia. Imagine having a beautiful villa all by yourself with a private infinity pool, the beach resort with the view of the undisturbed beaches and the mesmerizing Indian ocean and imagine all this comes at a cost that won't hurt your pocket. Luxury isn't a distant dream in Bali and no matter how much your budget is you would certainly find a lavish place to stay on your honeymoon. 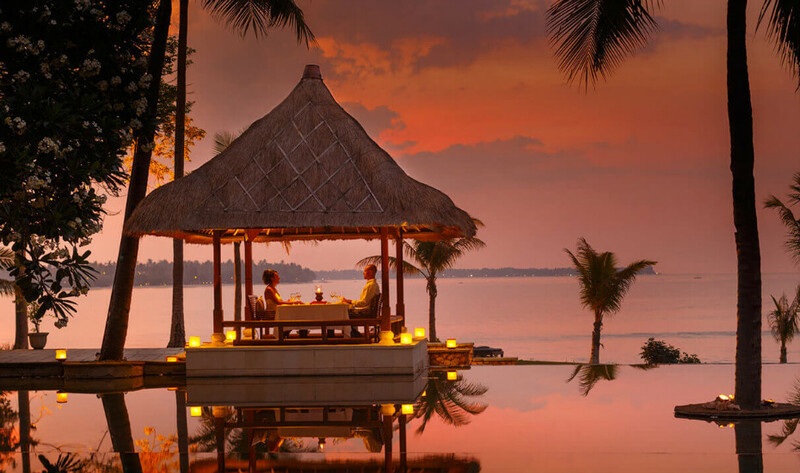 Known for offering the best romantic dates, there is no wonder why Bali is highly coveted as a honeymoon destination. Better than dates you have seen in the movies, you and your lover can enjoy a scrumptious meal with a bottle of wine and the surreal landscapes of nature. Isn't watching sunsets the most romantic thing? Do it while you sit with the love of your life on the seashore and witness the sun drowning in the sea. You can also go for a starry date night with millions of stars shining for you. There are hundreds of ways to surprise your love with a romantic date and don't give this experience a second thought. Amidst the stress of wedding planning, it's a great possibility that you forget all the documentation. One of the reasons to choose Bali as your honeymoon destination is it has visa on arrival and you can head out whenever you get free from all the wedding rituals. There are no hassles to get the visa-on-arrival in Bali if you have applied for it earlier. It saves a lot of time and inconvenience, helping you save that romantic vibe. The main airport for Bali is Denpasar airport or Ngurah Rai International Airport which is located approximately 4 km from Kuta, 9 km from Seminyak and 37 km from Ubud. From the airport, you can easily get a cab to reach your destination if your pick up is not already arranged by your hotel/villa/resort. How to reach Bali from India? Recently, the famous Indonesian airline- Garuda airline has started direct flights from Mumbai to Denpasar. The flights are convenient, less time consuming and comfortable. However, if you travel from Delhi or any other airport in the country you need to stop for a layover at the Kuala Lumpur airport in Malaysia. It is suggested that you catch a direct flight from Mumbai as it will save a lot of time and inconvenience of layover in another country. Nasi Goreng - Fried rice cooked with meat and lots of vegetables. Sate - marinated, skewered and grilled meat served with spicy Balinese sauce- Sambal. They use different kinds of meat from pork, goat, beef, chicken, fish to prepare this dish. Gado-Gado - A vegetarian dish prepared with a different variety of vegetables and rice. Nasi Ayam and Nasi Campur - Bali's version of chicken and rice eaten with the spicy sauce called Sambal. Bebek and Ayam Betutu - Duck or chicken filled with sauces and spices, then roasted for hours to attain the perfect flavour. It is eaten with rice. Bali Bintang - It is the famous beer in Bali that you would everywhere. Make sure you savour the taste. Because of its influence from Indian culture and Indian tourists you would find a lot of Indian restaurants in Bali. In case you are missing your country's food, you need not worry about anything because the island has ample of Indian restaurants that serve the delicious North Indian and South Indian cuisine. La Rogue - It serves Indian, International and Balinese food. Warung Little India - Try the Indian Thali and Samosas. Queen's Tandoor - For Indian non-vegetarian dishes such as Chicken Tikka, Butter chicken, fish etc. Where to Stay on Your Honeymoon in Bali? With a huge variety of accommodation all around the island, you can wish for anything and it will be there for you in Bali. Bali has lots of 3-star, 4-star and 5-star hotels. You can choose to stay in a beach resort with a beach view of your own and of course the best option is to stay in your private villa and make that place your home for your honeymoon in Bali. Ayana resort is located on the top of the cliff so you can imagine the views you'd be getting from there. It has 290 hotels rooms, 78 villas with direct access to the beach, infinity pool, in-house bar and spa resort. Is there anything else you could wish for? Ayana resort is the synonyms to luxury in the resorts in Bali. They have put their best creativity in making their infinity pools, which are literally hanging from your room to the open forest ahead. It has been named as #1 honeymoon destination in the Ubud area of Bali by Conde Nast Traveller. It has a collection of 44 private villas with private infinity pool and is located on the quieter side of the island. If you and your partner are looking for solitude and serenity during your honeymoon in Bali, then you must consider a stay amidst the tranquil rice terrace gardens of Ubud. The Chedi Club is a blend of luxury and nature. It has one and two bedrooms spa villas with a complimentary spa session of 90-minutes and luxurious suites with antiques and lush green views. The Anantara resort in Uluwatu is home to whopping 74 sea facing villas and suites. It is located very close to the Impossible beach which is a surfer's paradise. It is located on the cliff and infinity pools are heavenly with direct views of the beach and sea. It has its own spa, jacuzzi and restaurant and there is nothing more you would need for you honeymoon in Bali during your stay here. If you are looking for luxurious honeymoon in Bali without exceeding your budget, then The ONE should be your first pick. The 4-star property has 301 rooms with elegant interiors. There is a pool inside the hotel, a restaurant and the best thing is it is located in the most happening area of Bali-Kuta. Located in front of the Geger beach, there is no compromise with the beach views from the resort. The St. Regis resort the favourite destination among the honeymooners in Bali. Thanks to its spectacular services and hospitality. It has options of private villas and suites with a swimming pool and in-house restaurant. Type of stay: Room and suite. Located along with the best properties in Bali, Katamama has a rustic feel to it. It is a boutique hotel made by artisans and has sophisticated artefacts and interiors attached to it. Each room has been handcrafted by the local people. You can opt to stay here in a room or a suite with the private villa for your Bali honeymoon. Get your currency converted before going for your vacations to avoid high conversion rate and inconvenience. Also, avoid converting your money on the airport. Ask your hotels/ resort for a pickup and drop service from the airport. Carry sunscreen of SPF 50 to avoid the sun burns and never leave for outdoors with the sunscreen. Book your cruises, boat parties in advance to avoid last minute hassles. If you want to live in the main city with major destinations within your reach, choose your hotel in Kuta or Seminyak. The nightclubs in Bali has special ladies night on Wednesdays, you can get heads up for free drinks if you crack the right place. Be careful of the drug smugglers in the nightclubs, as the drug culture is very popular in the Bali's nightlife. Avoid carrying too much cash in local. Local transport in Bali are travel buses, cabs and bicycles and bikes are prevalent all around the island (especially in Ubud). Check for all the cost inclusions before booking your hotel to avoid paying the extra cost. Carry your necessary documents all the time with you. Also, a photocopy. Ask for the meat in your food before you eat if you are meat specific as the local people use different varieties of meat in their food. There is not enough that we can speak of about why and how you and your partner would have the perfect honeymoon in Bali, given the amount of beauty it has. So start packing your bags and head out to explore this scenic island with your significant other for the experience of a lifetime! Bali vs Maldives - Which Tropical Destination Should You Go to Next?